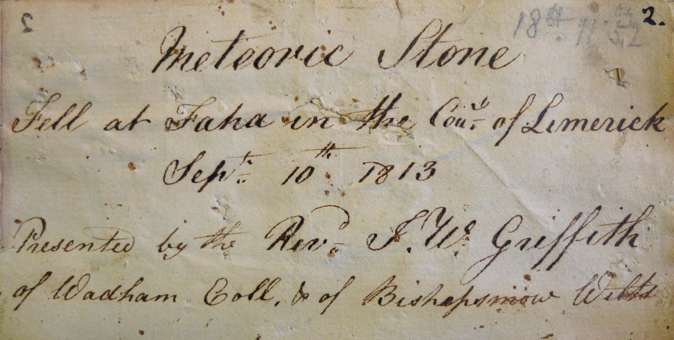 Almost exactly 200 years ago, at 9am on 10 September 1813, the residents of County Limerick in Ireland had a bit of a surprise. They heard loud bangs as a shower of meteorites fell to ground. More than 48kg of rock had just arrived on Earth from space! More specifically, it had come from the asteroid belt, a band of rocky debris that orbits the sun between Mars and Jupiter. Collisions can knock asteroids out of orbit, and occasionally send them hurtling on a collision path with Earth. Small fragments burn up in the Earth’s atmosphere, forming meteors or ‘shooting stars’. Larger pieces fall to the Earth’s surface, becoming meteorites. The meteorite that fell over County Limerick broke into pieces, and the one shown here is the second largest. It weighs nearly 8.5 kg, and landed near the village of Faha on the estates of the Blakeney family. The Rev. Robert Blakeney was an Oxford graduate whose ministry was in the parish of South Elm in Somerset. Perhaps the meteorite was found in the rectory after his death, for it was the new rector’s younger brother, the Rev. John W. Griffith, who presented it to the University of Oxford in 1825. The outer crust is smooth and dark where the meteorite surface melted as it fell through the Earth’s atmosphere. The inside is a pale grey rock. 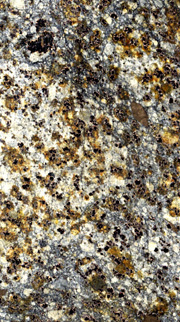 Look closely, and you can see flecks of metal – nickel iron alloy – and tiny rounded crystalline grains called chondrules in the image (right) showing an area of about 35mm x 20mm. The chondrules show that the Limerick rock belongs to a class of stony meteorites called ‘chondrites’. At around 4.55 billion years old, chondrite meteorites are some of the oldest materials in the Solar System. They give researchers important clues about how the planets – including the Earth – formed.